Ever wish your life could be turned into a musical? Are you in love? Then bring your partner on down to see Your Love, Our Musical and Rebecca Vigil and Evan Kaufman will make your dreams come true! 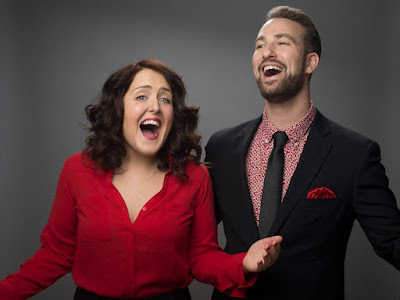 In this never the same improvised show, Vigil and Kaufman select a pair of lovers, do a quick interview with them, and turn their story into an aw-inducing musical romantic comedy. After a brief introduction, Vigil and Kaufman ask the audience who is in love and if you are with your lucky partner, you might just be selected to share your entire story to a room of strangers. Terrified? Don’t be because Vigl and Kaufman are wonderful hosts. They have this local morning talk show aura about them. They will make jokes at your expense and you’ll love it. Once they get enough information, they turn to the three piece band led by musical director Dan Reitz and the one night only musical comes to life. The musical I was fortunate to see was about gay couple Gabriel and Dan. Gabriel just moved to Argentina to be with Dan forever once they tie the knot. Through a bit of proding, Vigil and Kaufman were able to discover how their love came to be, who the ex was that was left behind, and what they love about one another. With just enough information, Vigil and Kaufman created a well-crafted short musical, even if a certain someone forgot a name. Vigil and Kaufman were quick on their feet and won the audience over with silly accents, bi-lingual lyrics, and the audience pandering Evita and “Don’t Cry for Me Argentina” bits. Vigil and Kaufman have a wonderful bond with one another. They blend and harmonize beautifully with each other. They easily pick up the other if there’s a slight moment of terror, proving their worth as collaborators. You can tell Vigil and Kaufman love this themed show. They pour so much heart into sharing others’ loves it’s exciting to watch. They are so entertaining, they may have sold you on coming back again and again to see Your Love, Our Musical.